I’ve always struggled with the words progressive and liberal. In America at least, liberal seems to mean so many different things to different people that it doesn’t seem to mean anything at all. I have no idea what progressive means at all. 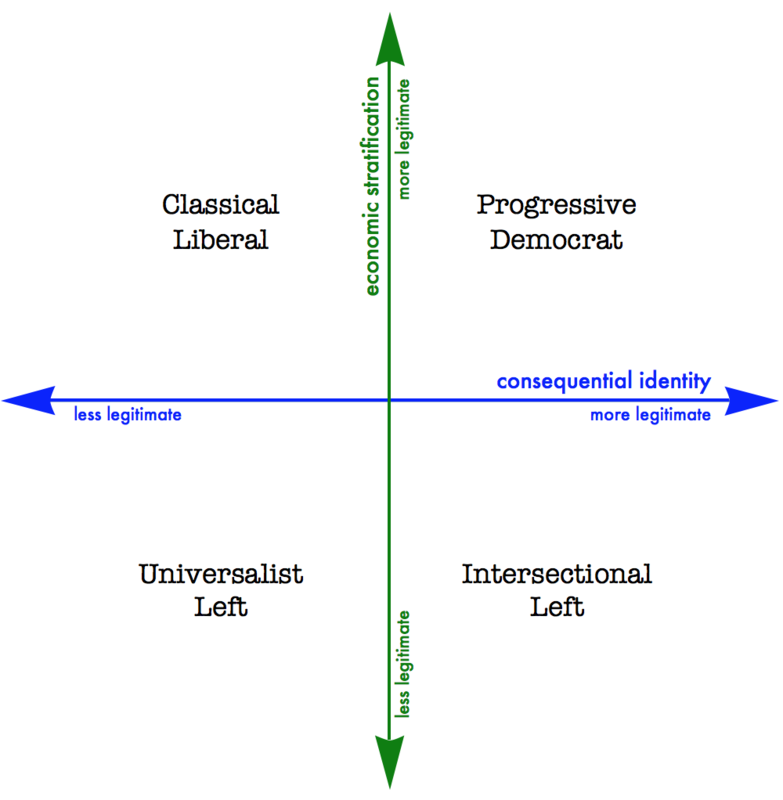 Interfluidity has a handy-dandy chart that attempts to sort lefties into useful categories. While I am sympathetic to, for example, the goals of Black Lives Matter, and mindful of the fact that, in my friend’s memorable phrase, “It’s harder to move through the world” if you don’t have a particular genital configuration or skin colour, I’ve long believed that identity politics is poisonous to social discourse and is at least partially responsible for Trump, UKIP and worse. Universalists want group identity to become less salient and consequential, and so resist tactics that highlight difference in order to promote intragroup solidarity and to sow open conflict with other groups. Identity-centered activists view solidarity and conflict as the best and perhaps only way to overcome identity-distributed oppression. To a universalist, tactics like “no platforming” sow precisely the sort of divisions we ought to be working to overcome. To an identity-centered activist, “no platforming” an apologist for racism or sexual violence is just winning.. Put me down firmly for universalist and allow me to claim Dr King for my side. The other axis is more difficult to place myself on. 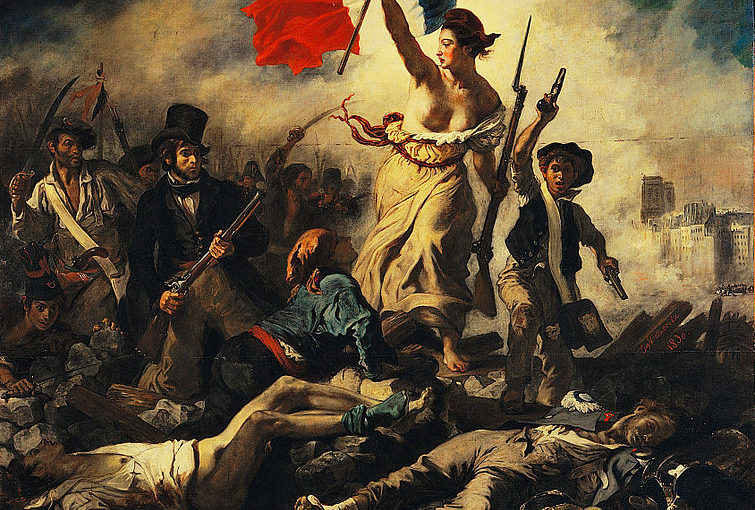 “Classical liberals” and the people sometimes referred to as neoliberals don’t challenge the existence of large, consequential differences between rich and poor. They seek to remedy what is oppressive in economic stratification by putting a humane floor beneath the consequences of being sorted downwards, and by working to ensure that the sorting is “fair”. They tend to promote equality of opportunity and emphasize education as a solution. I have long believed that runaway inequality is the biggest threat to American democracy. I believe that the game is rigged and that a handful of millionaires and billionaires have hijacked the apparatus of government and found a way to pretend that 47% of the population are moochers and parasites. According to the chart’s economic axis, my fear of runaway inequality is incompatible with my deep-seated understanding that meritocracy and rewarding success are vital to a flourishing society. I don’t see them as in opposition to each other. Strategically, I am a Classical Liberal but, practically, I think we need to reign in the power-grabbing plutocrats and find ways to ensure that Warren Buffet pays more tax than his secretary. The author of interfluidity seems to struggle with this too. The diagram above summarizes the differences as I see them among US liberal-to-left factions. Note that these are questions of more or less, not absolutes. I’d place myself in the “universalist left”, for example, but I do believe that some degree of economic stratification is legitimate and necessary, under economists’ usual rationale of preserving incentives to produce. I just think that the degree of economic stratification that currently prevails is way, way, way, way, way past the point where benefits of sharp incentives to produce are undone by even sharper incentives to cheat and outweighed by destructive social fragmentation. As far as I can tell, the author’s self-diagnosis is the same as mine, but he wants put himself in the bottom left quadrant. I’m pretty sure I’m up in the top left. In some ways it surprises me, but in other ways it really doesn’t, that our political beliefs are actually pretty close to each other’s spoken in those generalities. I guess it’s the details that can be debated. I suspect that the overwhelming tide in contemporary politics is both for and against identity politics. In a just world , identity politics would be a sideshow and we’d be fighting over whether we should be for equality of opportunity or equality of outcome. In this world it’s the main event. Sigh. Can we start with eliminating guaranteed outcome? Guaranteed outcome is a red herring. No one believes that’s a good idea.